Chess notation has an important role in the world of chess because it preserves the game’s history. It allows people to record games for posterity and gives them the chance to review the history of the game’s development to date. Notation also allows people to overcome language barriers and communicate with one another in a universally understood manner. 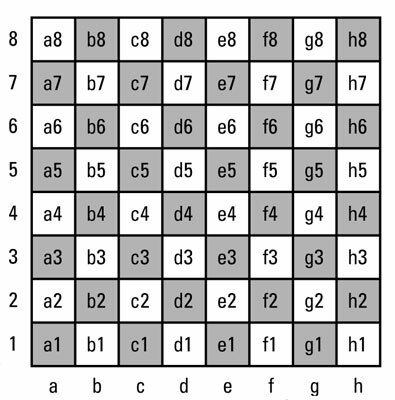 Many kinds of chess notation exist, from forsythe (a notation that computers understand) to different notations for various languages. One kind of notation, however, is universally understood: algebraic, which uses a single letter and number to name each square and a letter for each chess piece. 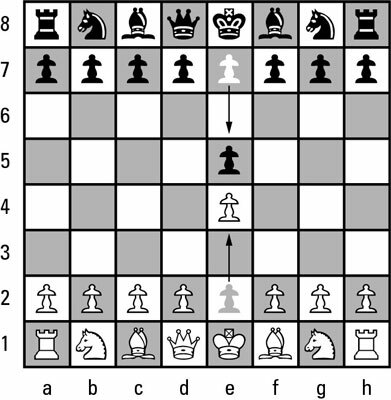 This notation system replaced the older English descriptive notation — which used an abbreviated form of a verbal description of the moves — because chess is for all people, not just English-speaking people. The letters must be capitalized to indicate a piece; otherwise, they indicate a square. The pawn doesn’t get its own designation. If a move indicates only a square, you can assume that the move involves a pawn. White moves first, followed by black, so it follows that white’s first move was to e4, and black’s was to e5. Remember, the absence of a piece designation (a capital letter) indicates a pawn move. 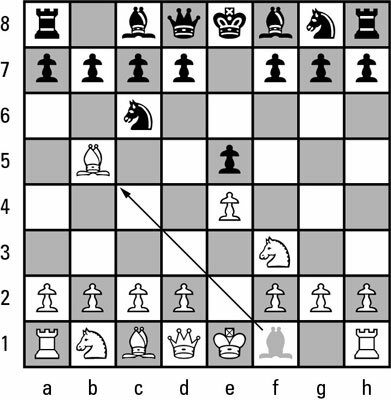 The following figure shows where white and then black moved their pawns. The first moves of the Ruy Lopez. For the second set of moves, the white knight moves to f3 and the black knight moves to c6, as shown here. The second round of moves. Now, white moves the bishop out to attack the knight. Remember that a capital B means bishop, and a lowercase b refers to the b-file. The white bishop moves to b5. 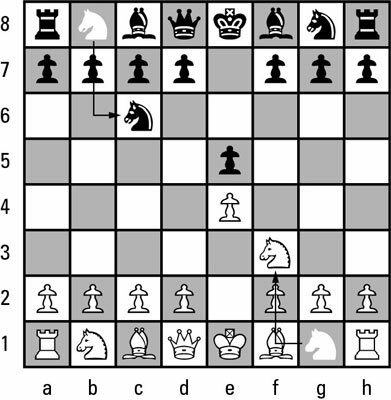 You can write any conceivable chess move by using algebraic notation. Every piece is identified, and so is every square. A complete description of the game is called the score of the game, and the paper you write the score on is called the score sheet.